No visit to the Bahamas is complete without a sampling of the local cuisine. One of the oldest and most traditional Bahamian ingredients is a sea muscle known as “Conch”; pronounced “konk” not “kon-ch”. Say it like the locals! The Queen Conch shell above is what the majority of conch used in Bahamian cuisine looks like in the ocean. If you find yourself snorkeling around the island and run across a shell like this, it is most likely home to a muscle inside. While it can be surprising to see something moving when flipping over a shell, they are totally harmless and quite private. They will hide from you inside their shell. Just a short walk from us under the bridge that connects Nassau to Paradise island, you will find some of the most delicious conch on all of the island. There are many ways to prepare conch: Conch Fritters, Conch Chowder, Scorched Conch, Seared Conch, and my favorite Conch Salad. 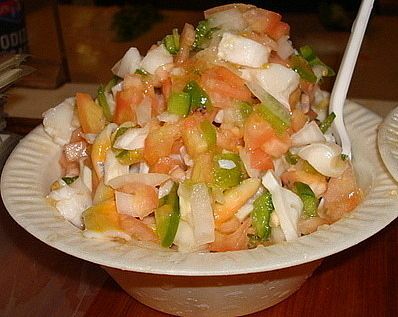 Conch salad is a Bahamian secret to a long youthful life. Bright citric acidity, fresh vegetables, conch, and a hint of spice make this dish one of the most unforgettable meals ever made. We suggest not leaving the island without trying some of our famous conch salad! Make sure to ask whoever makes it for you about the “pistol”. Enjoy your time in the Bahamas! !